The app could not be any simpler. Start listening to music using your favorite music app, then open up SleepTimer and choose how long you want your music to play. It’s that easy! A notification will appear to let you know the timer is working, even if you close the app. You can stop or change the timer at any time you like. Not happy with the preset timers? Just pick ‘other’ and enter in any amount time you would like – or set a specific time to stop the music. All of your settings are saved so you don’t have to keep picking the same timers over and over every day. 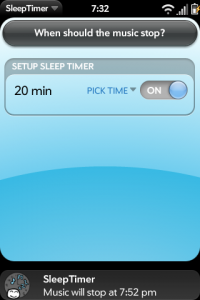 You can even tell SleepTimer to auto start your saved timer every time you launch the app! The use of SleepTimer isn’t limited to just sleeping. It works great with any situation where you need your music to stop after a set amount of time. Such activities include: working out, studying, and musical chairs. *SleepTimer has been tested to work several music players. Check the support page for an updated compatibility list. Next Next post: Updates Imminent!